Explore the beautiful green valleys and cities buzzing with chic style and world-class attractions, The Rhine Treasures offers Holland, Germany and Switzerland on a luxury river cruise. FREEDOM OF CHOICE: Perhaps embark on a canal cruise and admire the city from a glass-top boat. You may prefer to visit Zaanse Schans, a village famous for its wooden windmills, traditional Dutch houses and specialty produce. Alternatively, enjoy a stroopwafel presentation onboard. Tonight, enjoy a Gala Welcome Dinner. Day 3: Cologne, Bonn, Andernach. 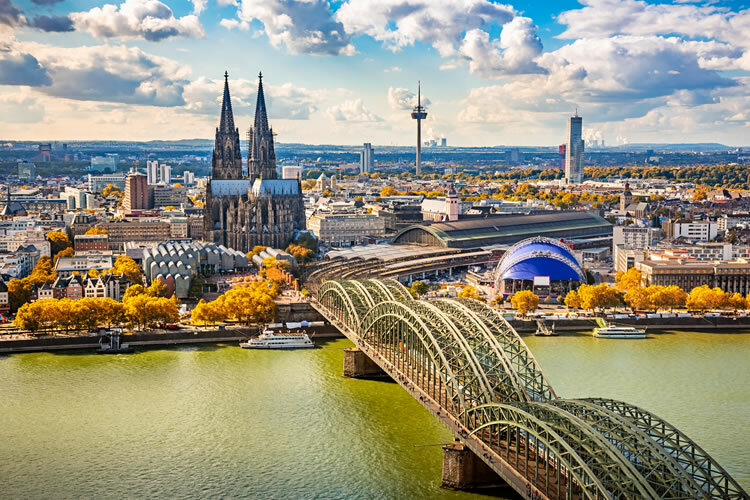 FREEDOM OF CHOICE: Enter Germany and cruise into Cologne, a beautiful city that is centred around the twin spires of its famous cathedral. Choose to take a bike tour of this historic city, or sample local beer and snacks on a walking tour. SIGNATURE EXPERIENCE: Later, rejoin your ship in Bonn and cruise to Andernach for an exclusive visit to Namedy Castle. This impressive 14th-century residence is home to Princess Heide von Hohenzollern, who has kindly opened the doors of her castle just for you. Enjoy free time, then savour dinner in the ballroom, accompanied by a classical piano recital. This will be an unforgettable evening you are sure to treasure. FREEDOM OF CHOICE: Arrive in Cochem and take a walking tour that includes Cochem Castle. Or take in the sights on a guided bicycle ride. Back on board, enjoy the scenery of the Moselle Valley as you wind your way along the Moselle River. FREEDOM OF CHOICE: Dock in Rüdesheim and take a trip aboard the quaint Winzerexpress mini-train to the town centre. Perhaps tour Siegfried’s of Siegfried’s Mechanical Musical Instrument Museum. Alternatively, choose to sample wines from the Rhine Valley during an onboard tasting or take a scenic gondola ride over the Rhine Valley. SIGNATURE EXPERIENCE: Be greeted by the friendly locals of Speyer and learn about their culture and day to-day lives as you are welcomed into their homes for a delightful afternoon tea. Cruise into Breisach where three sightseeing options await. The first, an excursion to the Black Forest region in Germany, will take you by coach through a lovely forested area, past a number of lakes as well as brilliant examples of rural German architecture. Stop in Triberg, once the home of Josef Keller, the inventor of Black Forest cake, before exploring the Black Forest Open-Air Museum. Your second option is a trip to the medieval city of Colmar, located on the Alsatian Wine Route in France. During a tour here, see half-timbered houses, the German-influenced old quarter, the Launch River and more. You’ll also enjoy a wine cellar visit and tasting. The third option you may choose from is a guided bike tour of Breisach. With both groups back on board, your ship departs for Switzerland.